Introduction to Will I Ever Be Free of You? For the past twelve years a yellow sticky note has somehow clung to my refrigerator. It says, “Go After Your Purpose and God Will Give You Your Dream.” I stuck that quote to the fridge when I was writing my first book, Will I Ever Be Good Enough? : Healing the Daughters of Narcissistic Mothers. It’s dog-eared and faded, but it still greets me as I begin each day. The purpose that has driven me throughout my career is the hope that I can help people make sense of the many complications in their lives created by dysfunctional families and guide them in healing from the legacy of distorted love that results. In my thirty-plus years as a therapist, I have seen that narcissism, a personality disorder that goes beyond mere selfishness and vanity, is a prevalent cause of family problems. Narcissists are grandiose in their need for praise and attention. While they often overestimate their own abilities, they diminish the people around them, particularly the ones they claim to love. Being in an intimate relationship with a narcissist can be exhilarating and all-consuming, but often, in the end, the narcissist consumes you, your hopes and dreams, your peace of mind, and your money. From the clinician’s chair, I have heard the pain and seen the tears of narcissists’ victims, including adult children, young children, partners and spouses, abused children, and victims of crime. This work has also led me to specialty areas, such as forensic interviewing and expert-witness testimony, and much interaction with the court system, attorneys, judges, law enforcement, and social services, on which I draw to help you in this book. Many people wrote to me after my first book, Will I Ever Be Good Enough?, was published to share their personal stories of life with a narcissistic mother. I was honored to receive so much correspondence from around the world and touched that readers reached out to me. In addition to their relationships with their mothers, however, my readers also wanted to talk about their romantic relationships. In reading the first book, they had learned that their mother’s narcissism had distorted their expectations of love so much that their relationships were now with other narcissists. Their letters described them as trapped in conflicts with narcissistic partners, enduring unending arguments and manipulations, saddled with enormous legal bills and never coming to a resolution. Almost every letter held a tone of despair. Why did they keep falling into partnerships with narcissists? Their questions led me to conduct more research and clinical work, and to write this second book. As you read on, please know in my heart I wish I were sitting with you on this journey to understanding your life. It is difficult to find yourself in such turmoil and pain, and difficult to comprehend how a relationship that probably started with such a powerful attraction could devolve so completely. Love is the greatest gift we give to each other, but narcissists do not have the capacity to love. They’re charmers, especially in the beginning of a relationship, but their limited ability to empathize or sympathize with other people’s feelings causes confusion and pain to their partners. It is also devastating to the children they bring into the world. If you are a child of a narcissistic parent or have fallen into the deep pit of a relationship with a narcissist, then you have probably been prevented from developing a whole and healthy life. I believe that you can free yourself from the pain that narcissists have caused you, learn more about yourself, and heal yourself and help your children heal, too. I hope this book brings you important information that will make a difference for you and your loved ones. whether you should stay in the relationship or leave, and when to make the right life choices for yourself and your children. And finally it provides you with a road map for recovery. As a divorce will likely involve the judicial system, the book also addresses issues you’ll come up against and how to deal with them in the current system. I also present my ideas about needed court reforms. In this practical guide you will learn how to weigh what is best for you and your children as you deal with a narcissistic partner. Don’t try to navigate a divorce on your own. Educate and prepare yourself to understand how narcissists react to disagreement, separation, divorce, and child custody. While I will tell you about some of the bad things that have happened to other people who have been through narcissistic relationships, I’ll also tell you the positive side of getting free and about the healthy, healing experiences you can then have. If you recognize yourself or your partner or spouse in these stories you read, I hope you will have the courage to continue and begin your recovery. Ultimately, the message of this book is one of hope. If you have ever looked at your partner and thought in despair, Will I ever be free of you?, the answer is yes, you can be free. This book offers tools to protect and nurture you and your children. Once you understand what turned your life upside down and inside out, you can break free and rediscover your authentic self. You can free yourself and your children from the legacy of distorted love. Let’s get started. Will I Ever Be Free of You? 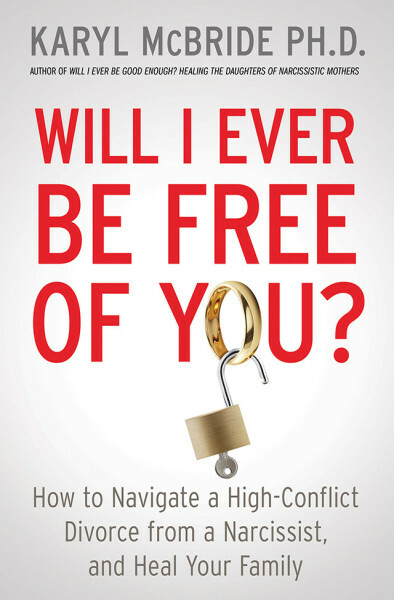 How to Navigate a High-Conflict Divorce from a Narcissist and Heal Your Family is not just another book about divorce. It is packed with healing suggestions and very child focused to help you and your children. Order online!